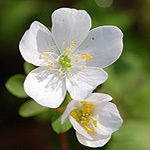 False Rue-anemone, Enemion biternatum Raf. 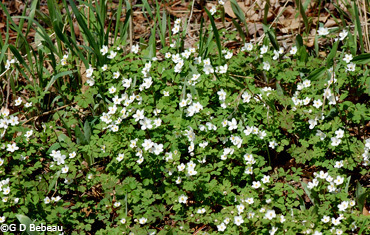 False Rue Anemone is one of the very early spring blooming plants in the Woodland along with Bloodroot and Hepatica, flowering in the sun before the trees leaf out. 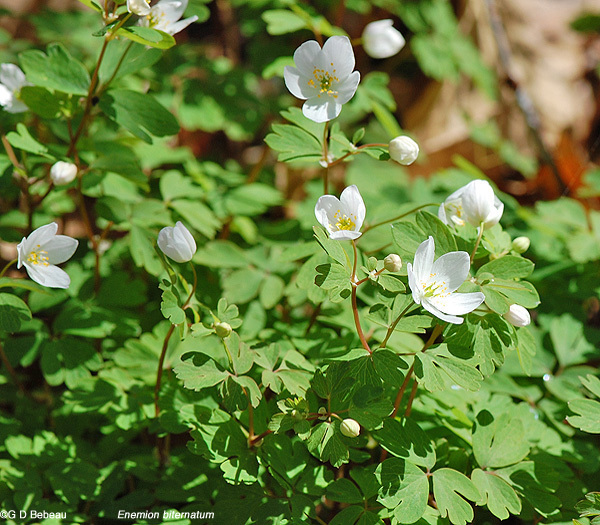 False Rue Anemone is a native erect perennial forb growing 4 to 16 inches high on slender, smooth, greenish to reddish-green stems with sparse branching. The leaves are compound, 2 to 3 times 3-parted with slender stalks. The leaflets are rounded and three-lobed, each about 1 inch across. The more basal leaves are long-stalked while the alternate stem leaves may be less divided, and there are a pair of rounded stipules where the flower stalk and leaf stalk meet. Like the stem, all leaves are hairless. The tips of the leaflets have a small pointed gland. The inflorescence is a single flower or a group of 2 to 4 rising from the leaf axil. Flowers are perfect, 5-parted, about 1/2 inch wide, with white sepals, no petals. 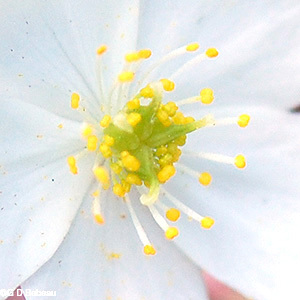 There are 25 to 50 stamens with yellow anthers. These arise from under the green erect carpels that are up to 6 in number, and have a short style. Seed: Each fertilized carpel produces a beaked seedpod (a follicle) that splits open when mature to release several reddish-brown smooth seeds. Sepals do not persist onto the follicle. 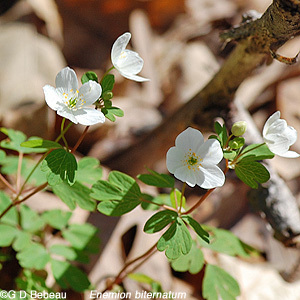 Habitat: False Rue Anemone appears in moist woods, wood edges and flood plains in rich loamy soil with full to partial sun. It grows from a weakly rhizomatous root system which allows it to form colonies. It is an early blooming plant but leaves persist into the summer. At Eloise Butler it is one of the first 5 plants to bloom in the Garden in spring, due to its location on a hill side that received sunshine before tree leaf-out. Names: The genus Enemion, according to Asa Gray (Ref. #7a), comes from a plant named by Dioscorides that had similar characteristics to this genus. The species, biternatum, is from the Latin, meaning "twice in sets of three' referring the leaf structure. In Eloise Butler's day this species was typically classified as Isopyrum biternatum and hence one of the common names was simply 'Isopyrum'. The author name for the plant classification - ‘Raf.’ is for Constantine Samuel Rafinesque, (1783-1840), European polymath who traveled in the United States, lived here many years, collected specimens, and published over 6,700 binomial names for plants. He applied to be botanist on the Lewis & Clark expedition but Jefferson turned him down in favor of training Lewis to act as botanist and saving the expense of another person. 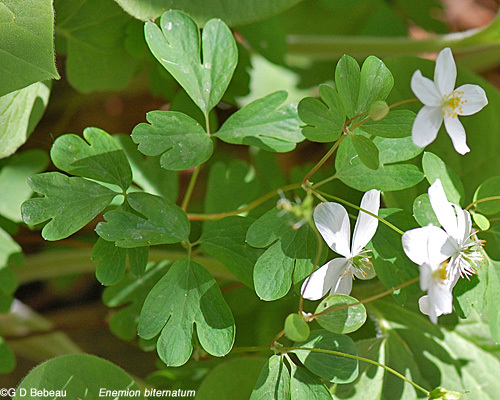 Comparison: The plant often confused with False Rue Anemone is the true Rue Anemone, Thalictrum thalictroides. There the leaflets are also in 3's, with true basal leaves and stem leaves in whorls and the leaflets are less deeply lobed and lack the glandular leaf tip. It also produces dry achenes for seeds, not a several seeded follicle. Compare also the Wood Anemone, Anemone quinquefolia. 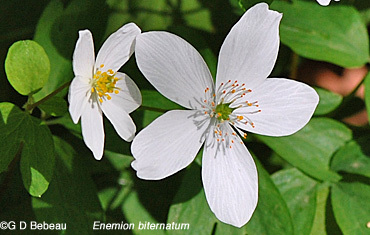 Above: The flowers are 5-parted with sepals exclusively white unlike the Rue Anemone where colors vary from white into pink. The leaves are compound but do not form a whorl on the stem. 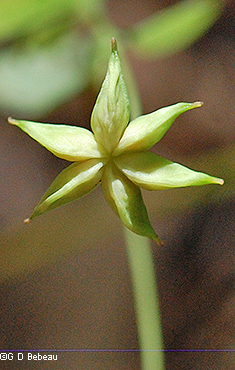 Below: Stamens number 25 to 50 and surround a ring of green carpels that number up to 6. 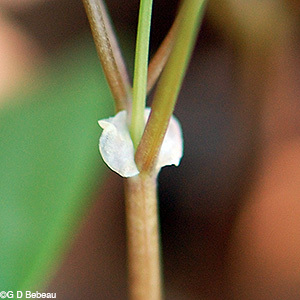 Below: 1st photo - At the base of the flower stalk where it joins the leaf stems are a pair of rounded stipules. 2nd photo - Extensive clumps can form from the weakly rhizomatous root system. Below: 1st photo - Note the deeply lobed leaves, not in a whorl, and the flower stems rising from the leaf axils. Note the tiny light colored gland dot at the tip of the leaflets. 2nd photo - The seed head with 6 beaked folicles indicating that all 6 carpels were fertilized. Notes: Eloise Butler's records show that she first obtained False Rue Anemone in 1908 from the Minnehaha area (near Ft. Snelling); additional plants in 1910, 1911, 1913 and 1914; then she also obtained over two hundred plants of this species on April 10-12, 1915 from an area at Minnehaha Falls in Minneapolis that she called "Fairy Land"; more were obtained in 1917. Her records use the older botanical name Isopyrum. The species is native to the SE Minnesota woods and most of the counties in the east portion of central Minnesota. This is the only species of Enemion found in Minnesota. 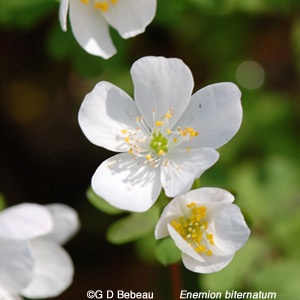 Four other species are known in North America but all are found only on the west coast and thus our species is named 'Eastern' False Rue Anemone as it is usually found in the eastern half of the U.S. and Ontario in Canada. Bloom dates: Garden records over a number years place the average bloom date at April 22-23 with April 1 usually being the earliest and May 4 usually the latest. The actual earliest record was March 24 in 1981.